Basement box sills can be significant areas for energy loss in any home. Located where the basement ceiling joists (those that support the first floor of the house) meet the exterior foundation walls of the home, leaky box sills can be a significant source of energy inefficiency in a structure, allowing for outside air infiltration. Traditionally, these areas have been insulated with fiberglass batts. This practice creates a poor thermal barrier from outside temperatures and does nothing to prevent cold air infiltration. Using closed cell spray foam provides both insulation and air sealing and has become the new standard for modern, efficient homes. The photos to the right provide a thermal image of the underlying result of using just fiberglass batting in the box sill – air leakage around flows right through the batting and continues to impact basement temperatures. This is also known as "replacement air" because warm air leaking up and out the top floor is typically replaced from this area. 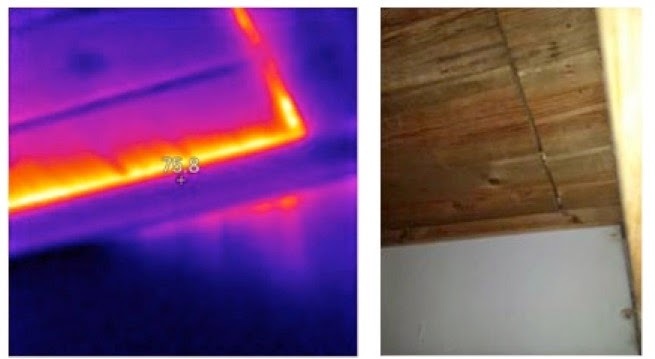 Energy auditing tools, like an infrared camera or blower door test, discovered this problem years ago and are used more and more to identify leaky box sills in homes today. Contact us to learn about this and other places your home will benefit from by having an energy audit done. Have you ever wondered what your home’s energy loss “looks” like? Wish you could get a visual image of your home and see its biggest energy leaks? Infrared imaging can help. 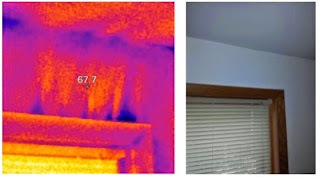 Infrared imaging, also known as thermography testing or thermal imaging, visually identifies areas of air leakage and cold spots in a home’s walls or ceilings. An infrared image is captured with an infrared camera or on infrared video. After the image is captured, our energy assessment team analyzes the results and makes recommendations to minimize the heat loss and reduce energy bills. Access doors. This image shows how much heat can be heat (in the summer) or cold air in the winter can be lost through an access door that is not insulated. Window frames. This picture shows how a good window can be very uncomfortable due to poor insulation or air sealing of the trim. The window itself is very good, the air leakage is coming from a very thin opening behind the trim. Ceiling light penetrations. This picture shows a very small light attached to the ceiling, yet through infrared imaging, it is possible to see how much air leakage is actually happening at such a tiny connection. Our energy assessment team performs infrared scans during all assessments. Contact our office to learn more and schedule an energy assessment. Funds Available for Vermiculite Removal and Re-Insulation! We are happy to share this news with homeowners! Funds area available for vermiculite removal and re-insulation. Rockweiler Insulation does not do vermiculite removal and, should you have this need, we are happy to recommend a company who can assist. W.R. Grace, the parent company that marketed, sold and distributed asbestos containing vermiculite for over 50 years, has recently settled a court case and begun funding the Zonolite Attic Insulation Trust. This is a $60m trust from which eligible claimants will be reimbursed for their legitimate ZAI Property Damage Claims ("ZAI PD"). The Trust provides a reimbursement contribution of 55% of the abatement cost for eligible claimants up to a ceiling of 55% of a $7,500 removal bill (this comes to $4,125). E.g. if you spent $7,500 removing and replacing the insulation, you are potentially eligible for the maximum reimbursement of $4,125. If you spent $3,000 for abatement and re-insulation, you are potentially eligible for reimbursement of $1,650 (55% of $3,000). This reimbursement includes both removal and re-insulation of the home. If ZAI was installed in a structure which you own or rent, or have owned or rented, and you incurred expense removing, abating (to include re-insulation cost) or containing the ZAI, you are entitled to submit a claim. The Trust applies to both residential and commercial buildings. Both residential and commercial buildings are subject to the same criteria when filing a claim and providing proof of ZAI, proof of abatement and expenditures. Authentic copies of canceled checks, credit card statements, or bank statements must be provided. Cash payments will be subject to a higher level of scrutiny. If these items are not available, you may order a $25 sample kit which would be returned to the trust and tested in a laboratory for the presence of barium, a signature constituent mineral for the asbestos containing vermiculite. They request you send 6 ounces, but the test can be performed with as little as one ounce. If your home has already had removal done, there is a good chance a crevice somewhere in the home still contains a sample for use and you can still file a claim. There is no time limit on these funds. For more information, visit www.zaitrust.com or www.zonoliteatticinsulation.com.